Lamacchia Realty and REAL Training and Systems have released the REAL Training course schedule beginning January 2019 through March of 2019. These comprehensive REAL Training programs address real-world situations that prepare Realtors to increase their skills and increase their sales! 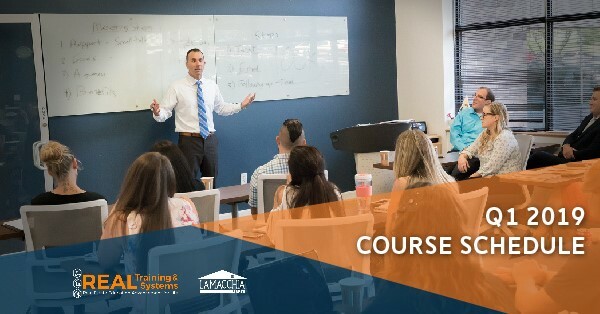 Given the timing of the slow season and Realtors gearing up for the spring market, Lamacchia Realty is running more courses from January to March than ever before. Learn how to build your business from your existing client database and build by referral business. This course is like no other By Referral or REAL Training Course offered because it rewards agents with marketing collateral and advertising materials for use with their client base. Click here to learn the details about this course. Significantly increase your listing leads and signups! This course will cover every step that should be taken from getting a seller lead to signing up a listing at your price and commission. Click here to learn the details about this course. This course helps agents convert leads from online sources like Zillow or Trulia as well as from your sphere of influence into committed buyers. Click here to learn the details of this course. Dealing with seller objections when it comes to everything from price adjustments to home inspections is an art that is taught in this two week course. Click here to learn the details of this course. Once you have a Buyer signed up to work with you there are so many things left to do. Learn each step of the process and get your buyers in their dream home. Click here to learn the details of this course. Hear how our training has increased business for these reputable Brokers and Agents!